What is the GridBuddy sales cloud add-on? The GridBuddy Sales Cloud Add-on is a starter pack for GridBuddy that includes grids and page layout components for streamlining Salesforce Sales Cloud use cases. Once installed, each grid can be modified to match your unique requirements. You must have GridBuddy Unlimited version 3.22 or higher installed in the target org. To see what version of GridBuddy you are on – go to Setup > Installed Packages > GridBuddy. 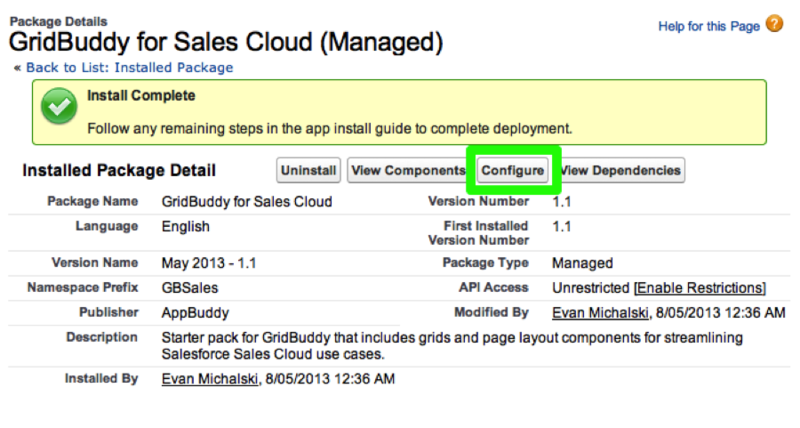 To start the add-on installation, go to www.appbuddy.com and click on the “GridBuddy for Sales Cloud” link on the home page. When the installation completes – you will see a success screen. Click the “Configure” button to launch the Getting Started page. 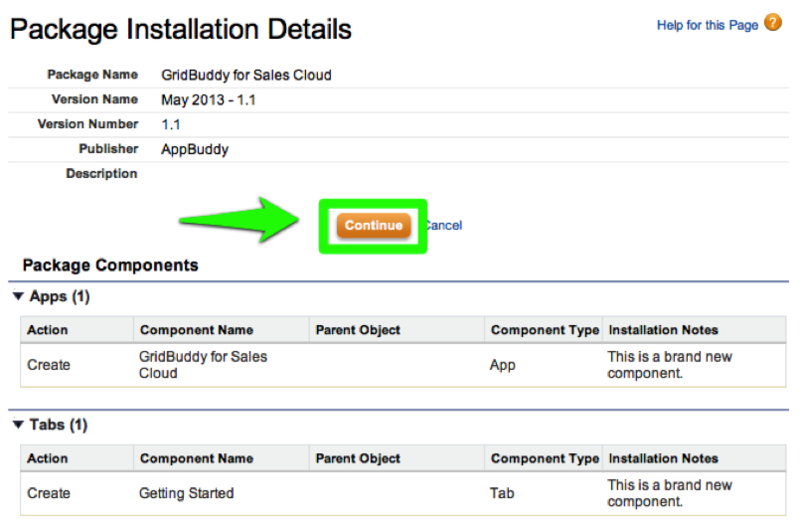 After installing the Managed Package – your new grids will appear in the GridBuddy “Grids” tab. To see this, select GridBuddy Opportunity Pipeline Manager from the application dropdown on the top right and then click on the “Grids” tab. This will show you a dropdown list of all the grids included in the add-on. A new folder called “Sales Cloud” will be added to the list that shows, and this folder is assigned by default to all profiles. You can adjust access by profile permission by following the steps outlined in the “Manage Folders” section of the user guide. 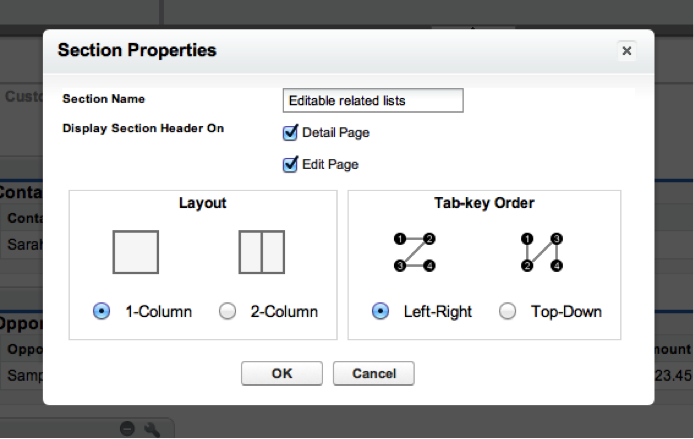 We recommend adding the Grids tab to your default view for the easiest end-user access to the grids. 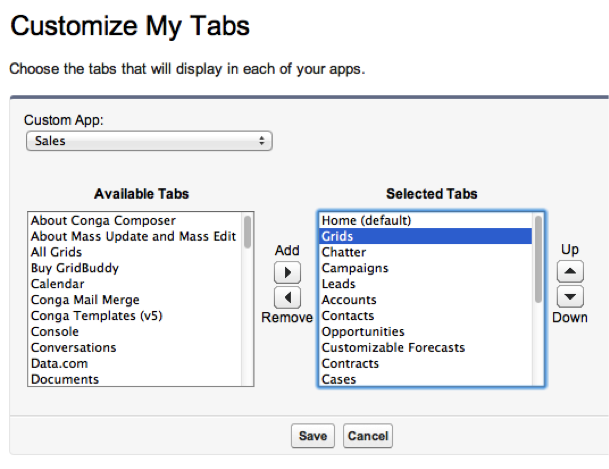 To do this, go into your Sales Cloud view, click the “+” sign on the tabs toolbar, and then click the “Customize My Tabs” button. 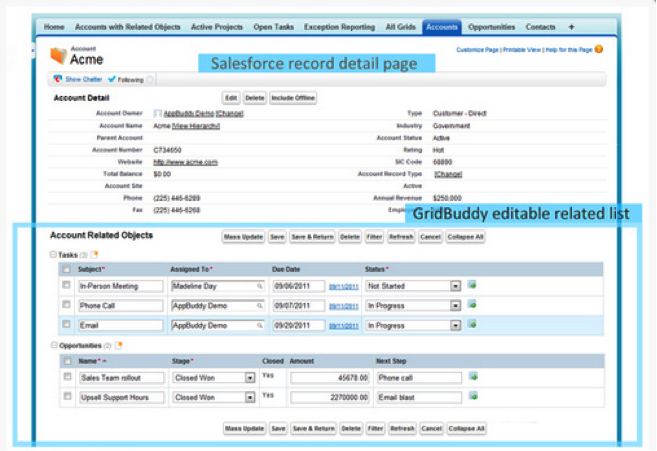 GridBuddy Opportunity Pipeline Manager comes pre-packaged with editable related lists that can be added to Salesforce record detail pages. Account – GBAddOnAccountPageTabbedGrid.page – Tabbed editable related lists for the Account record detail page. Opportunity – GBAddOnOpportunityPageTabbedGrid.page – Tabbed editable related lists for the Opportunity record detail page. Contact – GBAddOnContactPageGrid.page – Editable related list of Tasks for the Contact record detail page. Lead – GBAddOnLeadPageGrid.page – Editable related list of Tasks for the Lead record detail page. 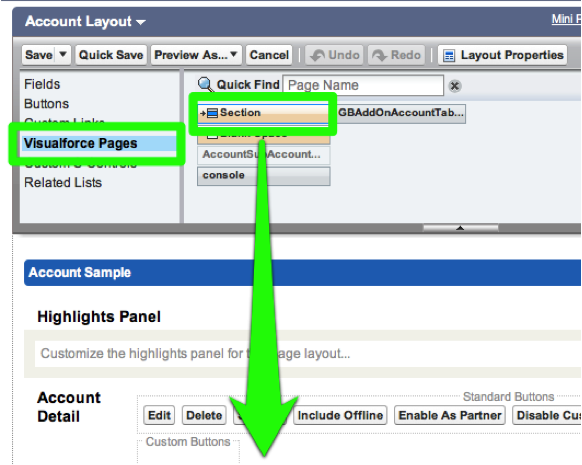 Now drag the “GBAddOnAccountPageTabbedGrid” Visualforce page into the new section you’ve created. 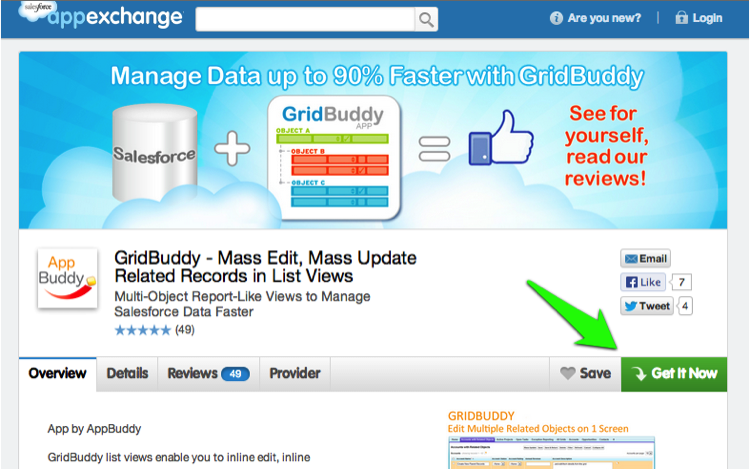 GridBuddy Opportunity Pipeline Manager comes packaged with “Edit in GridBuddy” buttons that can be added to the Account or Opportunity list views. These buttons allow users to access a grid from the list view so users can see an editable list view that includes related objects. For example, when the “Edit in GridBuddy” button is added to the Account list view, it launches the “Accounts with Related Objects” grid. To add the “Edit In GridBuddy” button to the Account list view, go to Setup > App Setup > Customize > Accounts > Search Layouts. Click “Edit” next to the Account List View option and add the “Edit In GridBuddy” tab to the Account list view. Now click the “Accounts” tab and click “Go”. And the “Edit In GridBuddy” tab is visible. Note that custom filter conditions you’ve defined in the Views are not transferred to GridBuddy. The “Accounts with Related Objects” grid that is launched from this button can be updated to reflect custom filter conditions in the GridBuddy configuration settings. 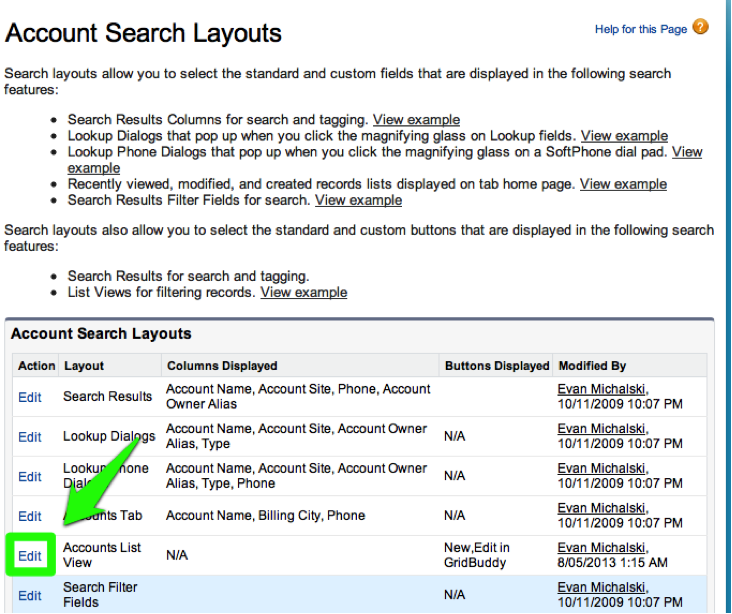 To set up the list view button for Opportunities – follow the same steps in the Opportunity Search Layout section in Setup. All grids on the GridBuddy Opportunity Pipeline Manager Add-on utilize standard fields that are available in any Salesforce org. As an Administrator, you also have the ability to customize the pre-packaged grids to include the objects and fields that are specific to your use case (both standard and custom). Note: Changes you make in the Grid Wizard will take affect for all users. 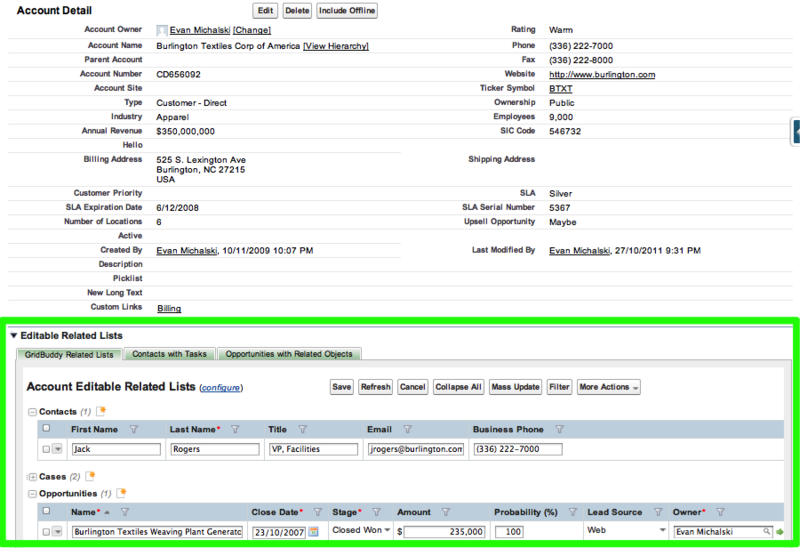 Accounts with Related Objects – shows Accounts with related Contacts and Opportunities. Opptys with Related Objects – shows Opportunities with related Tasks and Opportunity Products. My Open Tasks – shows Tasks assigned to me that have not been Completed. Contacts with Tasks – shows Contacts with related Tasks. My Opportunities – shows Opportunities assigned to me, sorted by Account Name. Today and Overdue Tasks – shows Tasks assigned to me that aren’t Completed and the due date is either today or has already passed. 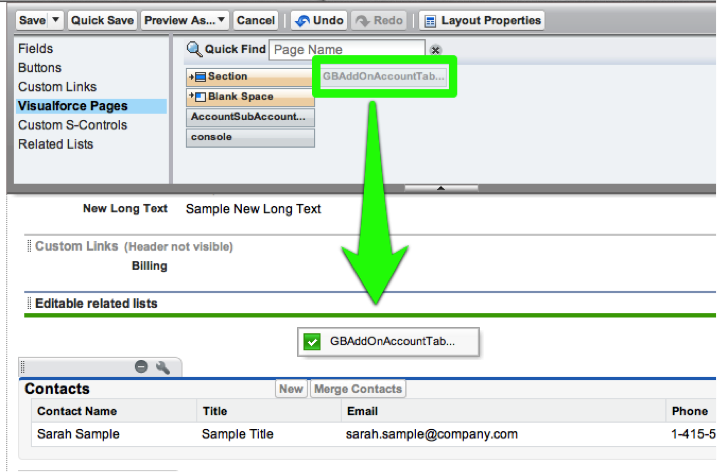 GBAddOnAccountPageTabbedGrid – Tabbed grids that can be embedded on the Account record detail page. Opptys with Opp Products tab. GBAddOnOpportunityPageTabbedGrid – Tabbed grids that can be embedded on the Opportunity record detail page. GBAddOnContactPageGrid – Tasks grid that can be embedded on the Contact record detail page. GBAddOnLeadPageGrid – Tasks grid that can be embedded on the Lead record detail page. 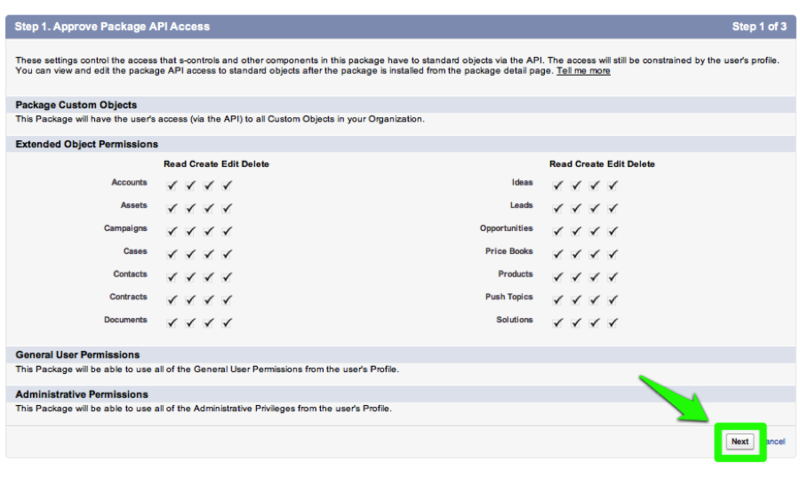 Edit_in_GridBuddy on Account – custom button to launch Accounts with Related Objects grid from the Account list view. 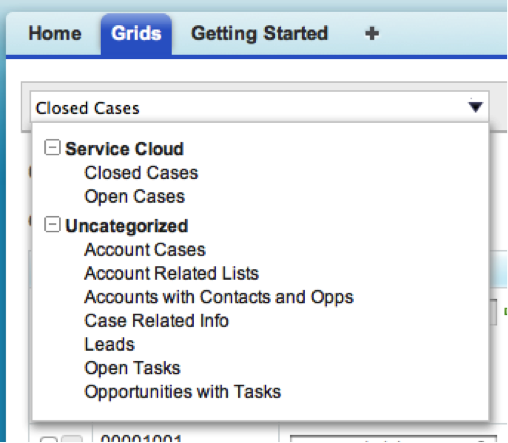 Edit_in_GridBuddy on Opportunity – custom button to launch Opptys with Related Objects grid from the Account list view. Add these buttons to the Account, Opportunity, Contact, and Lead detail page layout to easily launch “related info” grids in a new window or from Cirrus Insight. Launch_Related_Records on Account – launches the GBAddOnAccountPageTabbedGrid tabbed grid view. Launch_Related_Records on Opportunity – launches the GBAddOnOpportunityPageTabbedGrid tabbed grid view. 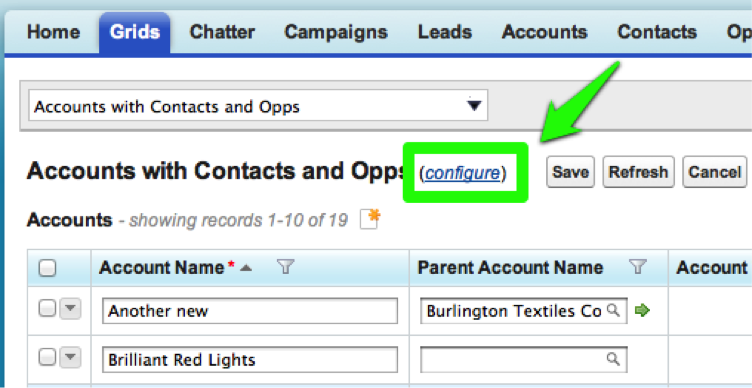 Launch_Related_Records on Contact – launches the GBAddOnContactPageGrid tabbed grid view. Launch_Related_Records on Lead – launches the GBAddOnLeadPageGrid tabbed grid view.